Wow, I haven't seriously updated this in a while. Lizzie will be 10 months old tomorrow. I can not believe it. 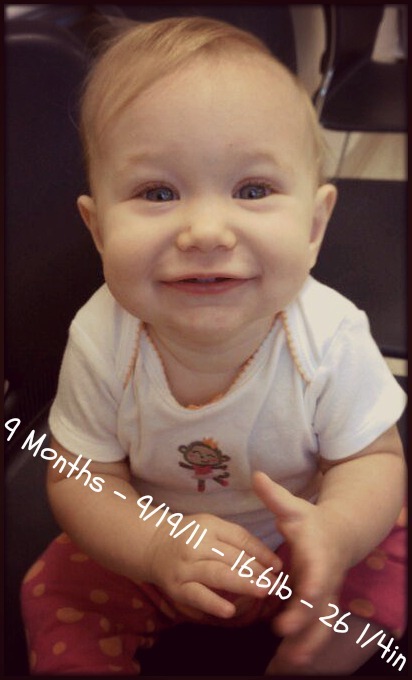 At her 9 month check up (9/19), she weighed 16.6 pounds, Length 26 and 1/4 inches, Head 46 and 1/2 cm. She had to have two shots but she only cried for a second. My little peanut isn't so little anymore. She is crawling everywhere and getting into everything. She doesn't listen to me at all. She is no longer eating baby food - grown up foods all the way! :) She has been sick this week. Her first cold. She has a mild fever and a mucus-like cough. But she is a lot better now. She can wave goodbye and clap. She has three teeth. I'm so proud of her. I love her so much.